As you know, we absolutely adore the Stylecraft Batik yarn, and the new Elements yarn is just as pretty and squishy! 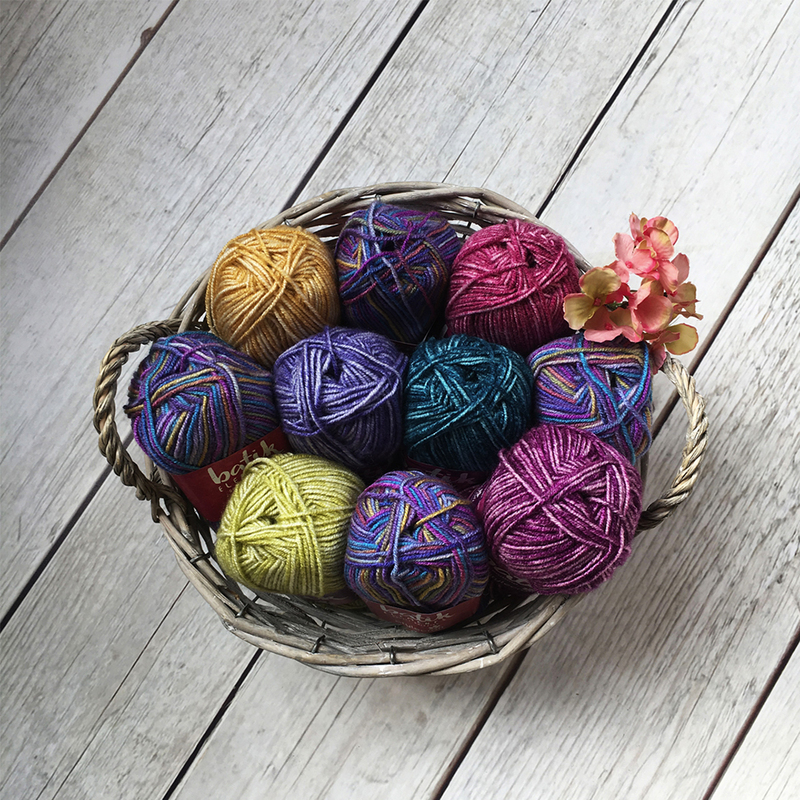 Our chosen pack for the blog tour is called Rainforest, using the Platinum colourway of Elements and matching and contrasting colours Teal, Old Gold, Pistachio, Violet, Plum and Raspberry. 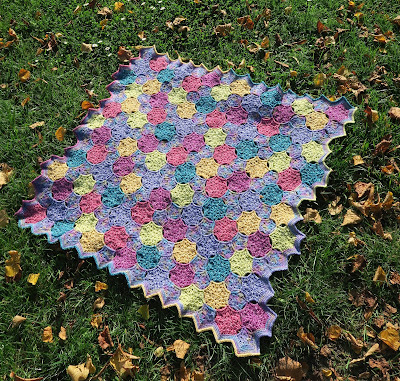 We wanted to do something a bit quirky with this yarn, so developed a pram blanket that finishes about 80cm by 85cm, made from tesselating heptagons and pentagons. You could easily make it bigger with more yarn. The blanket is all Join-as-you-go, so no sewing a million motifs together, and we have provided a colour chart of the blanket to help you get the colour spread nice and random! And those colours... all we could think of was looking at pebbled pools through the water, with precious jewels instead of boring rock pebbles. Hence, the Jewelled Pebbles Blanket! 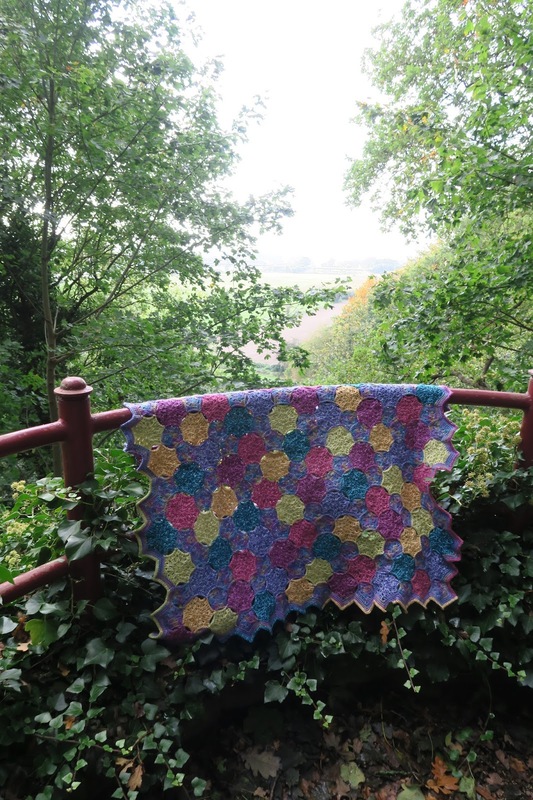 Want to win a Rainforest Yarn Pack to make this pram blanket? The giveaway is open until 10am GMT tomorrow! For the next stop on the blog tour and another chance to win a yarn pack, make sure you visit Cherry Heart tomorrow! Get Knotted Yarn Craft, Every Trick on the Hook, Zooty Owl, Lucia's Fig Tree, Cherry Heart, Hand Knitted Things, Josiekitten, The Twisted Yarn, Annaboo's House, Crafternoon Treats, The Patchwork Heart, Emma Varnam, Attic24, Jane Crowfoot and Catherine's Crochet Corner. - JAYG - motifs are only joined in corners, not along sides. 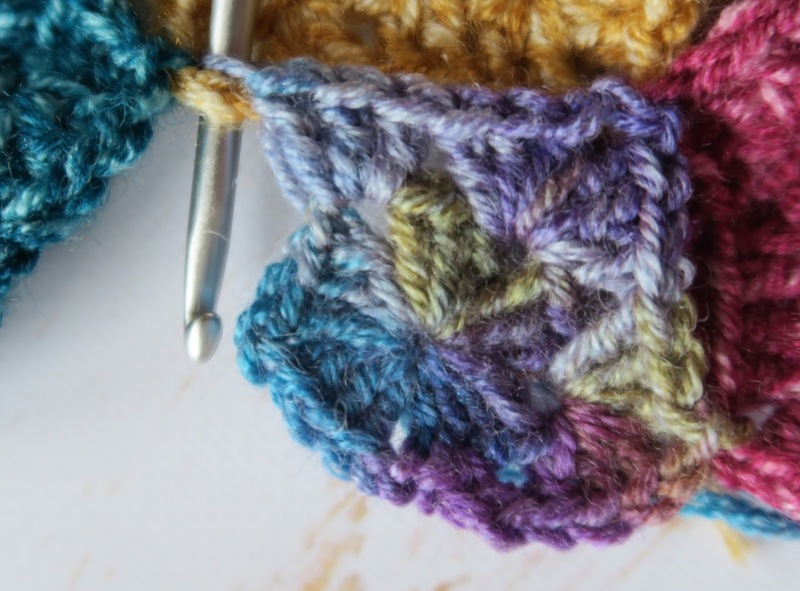 Replace one chain of corner with slipstitch into adjacent corner ch space (replace both chains when joining to two adjacent corner ch spaces). Row 2 - ch3. *in next corner space, (3dc, 2ch, 3dc)* 4 times. In first corner space, (3dc, 2ch, 2dc) and slst join to top of first ch3. finish off. (6dc per side). Starting in top left corner, join each shape with JAYG during final row, in corners only. 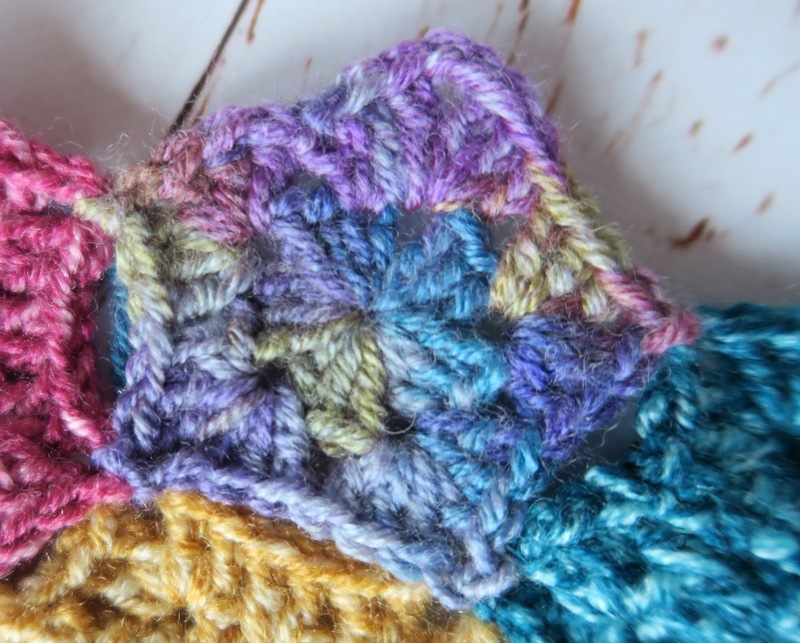 The first three rows are crocheted in Platinum. Row 1: Join the yarn in the pentagon on the left side bottom. 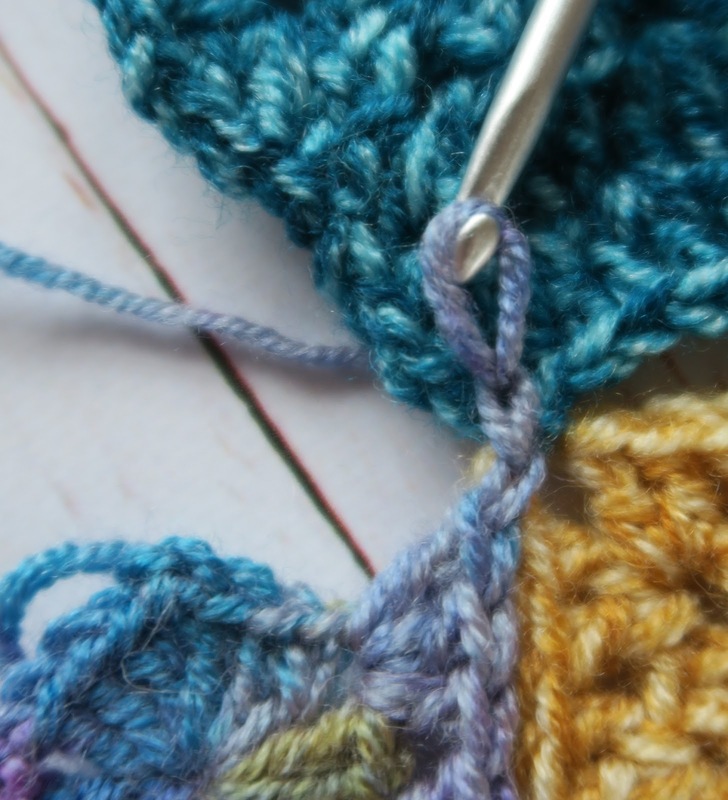 1ch and then 1sc into the same stitch. 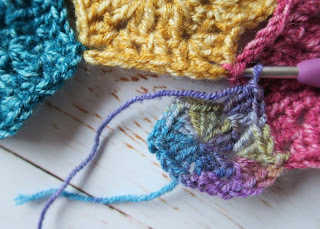 Crochet 1sc into every st, except into the tops of the heptagons and the pentagons. Crochet 3sc into these. At the end of the row, sl st into the first sc. 1ch. 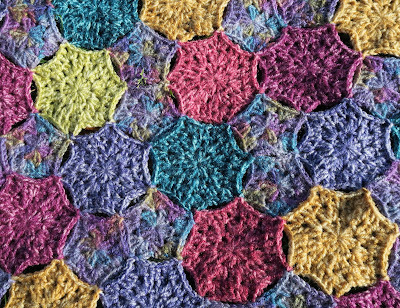 Row 2 + 3: 1sc into every st with two exceptions: a) crochet 3sc into every top of the heptagons and the pentagons b) 2sctog across the 2st at every dip where two pieces very joined. At the end of the row, sl st into the first sc. 1ch. Finish of at the end of row 3. Weave in the ends. 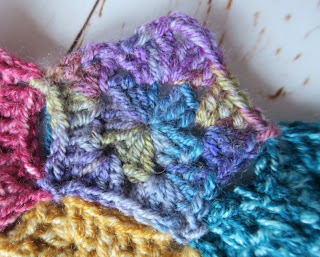 Row 4: The row is crochet like row 2. You will change color in the middle of each side. 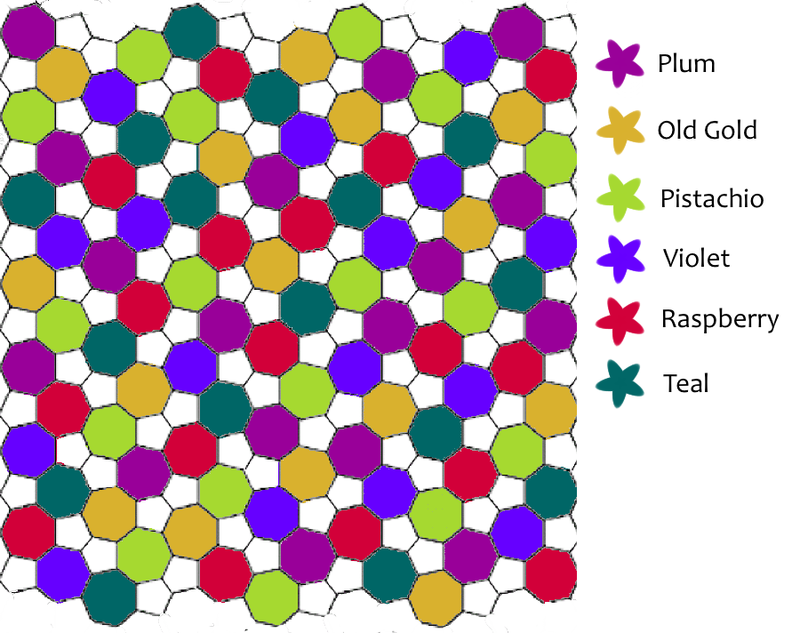 Use the following color order: Teal, Old Gold, Raspberry, Plum, Teal, Old Gold, Violet, Pistachio. Finish off and weave in the ends. Maße: 80cm x 85 cm. JAYG (Join as you go) – Die Motive werden nur in den Ecken verbunden und nicht an den Seiten. Ersetze eine Lm der Ecke mit einer Km in die angrenzende Eckenlücke (ersetze beide Lm mit einer Km, wenn du ein Motiv mit zwei angrenzenden Eckenlücken verbindest). Reihe 2: 3Lm. *in die nächste Ecke: (3Stb, 2Lm, 3Stb)* x 4. In die erste Ecke: 3Stb, 2Lm, 2Stb) und dann Km in die oberste Lm der Anfangs-3Lm. Abmaschen (6Stb an jeder Seite). Beginne in der oberen linken Ecke und verbinde die Motive jeweils in den Ecken mit dem JAYG in der 3.Runde (Siebenecke) bzw. 2.Runde (Fünfecke). Die ersten drei Reihen werden in Platinum gehäkelt. Reihe 1: Beginne in der unteren linken Ecke. 1Lm und dann 1fM in dieselbe Masche. Häkle 1sc in jede Masche, außer an den Spitzen der Fünf- und Siebenecke. Häkle dort 3fM in die Spitzenmasche. Am Ende der Reihe: Km in die erste fM. 1Lm. Reihe 2 + 3: 1fM in jede Masche mit zwei Ausnahmen: a) Häkle dort 3fM in die Spitzenmasche der Spitzen der Fünf- und Siebenecke. b) 2fM zus abm in jedem Tal, d.h. dort, wo zwei Motive verbunden wurden. Am Ende der Reihe kM in die erste fM. Am Ende von Reihe 3 abmaschen und Enden vernähen. Reihe 4: Die Reihe wird wie Reihe 2 gehäkelt, aber du wirst die Farbe jeweils in der Mitte einer Seite wechseln. Benutze hier die folgende Farbreihenfolge: Teal, Old Gold, Raspberry, Plum, Teal, Old Gold, Violet, Pistachio. Am Ende abmaschen und die Enden vernähen. Thanks for this, i follow you on insta and realy love your work. This is so lovely. Looks so complicated yet when you read the pattern it's not. So clever. I'm a recent convert to join as you go. It's such a time-saver. Crying now! I can’t believe I missed the first 4 days particularly as this is my favourite pack! Oh well I will just have to buy it now. Keep following the blog tour - there are more rainforest packs to come!! 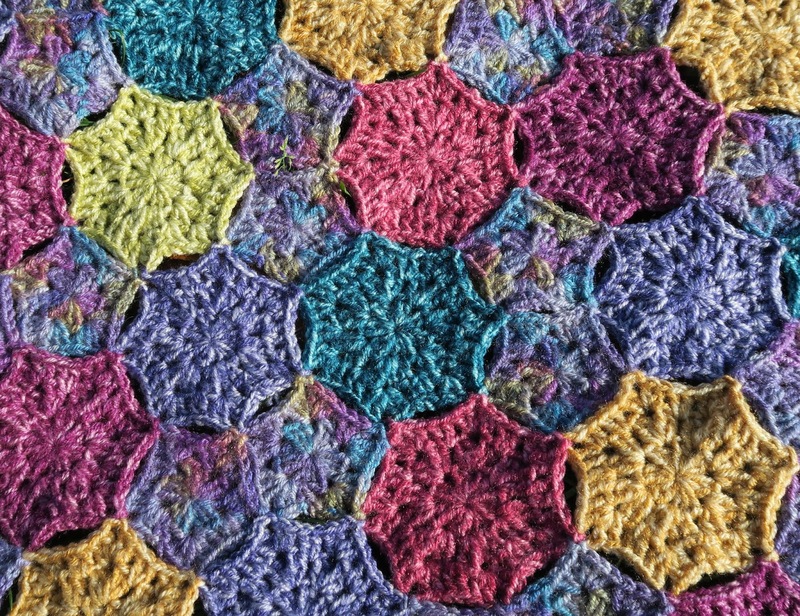 I love how your JAYG creates circles around your motifs, like ripples in a pond. 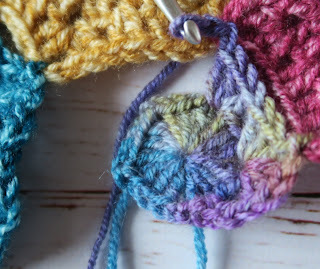 The shapes around the border remind me of your Carousel blanket. 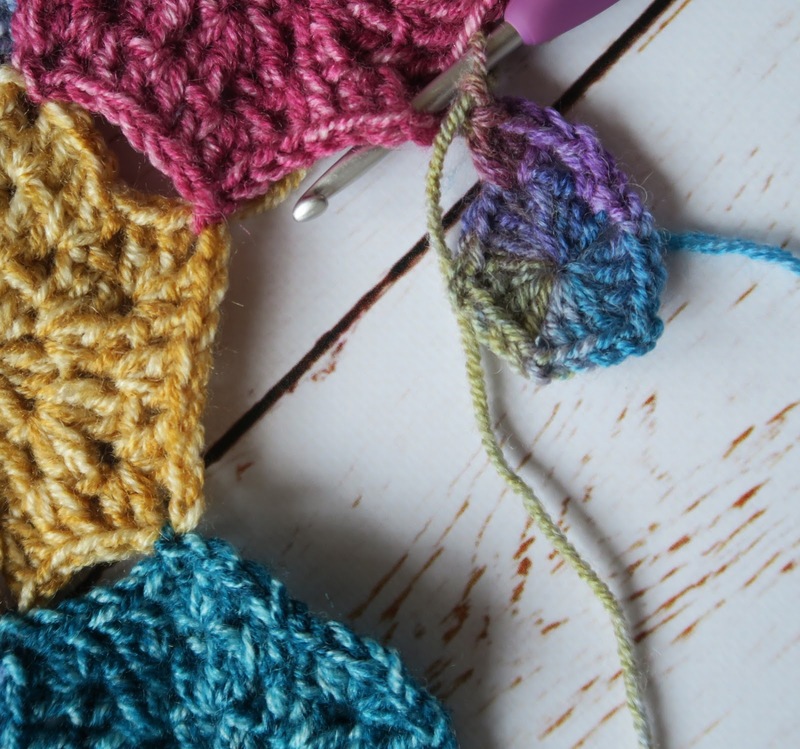 I love that you are not frightened to experiment with crochet - isn't that the fun of it? Enjoy the rest of your blog hopping! What an awesome pattern! So well designed! And I love the colors. Hi there! We are Michelle and Anne and we share this blog! We have been friends for ages even though we live in different sides of the world (Australia and Germany). 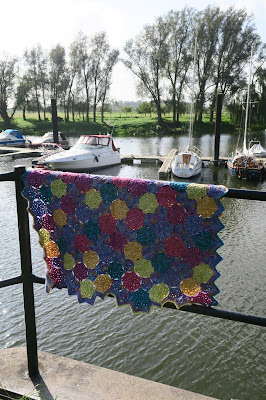 We share a common passion which is crochet (hence the blog name) but we blog about Australia, Germany, food and other stuff we like too. 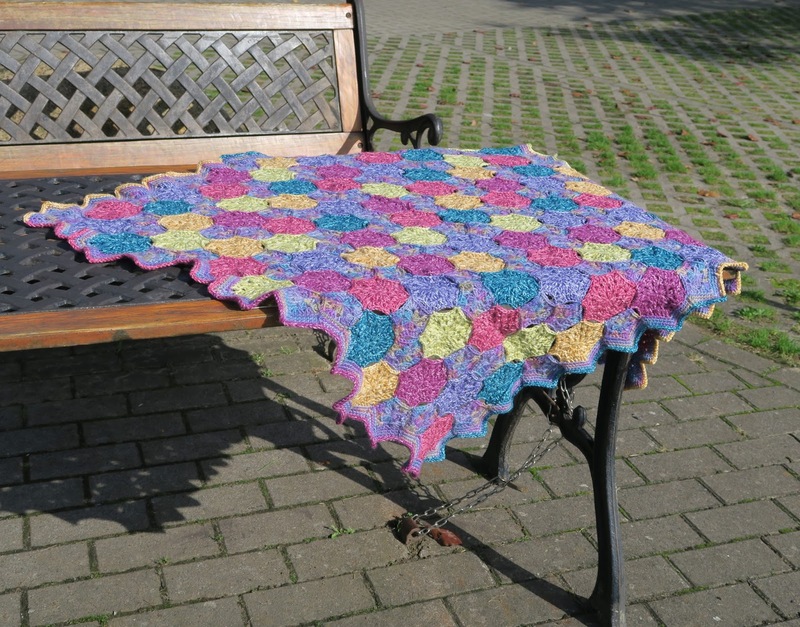 Happy 4th Birthday, Crochet Between Worlds! PATTERN: Bargello Wave Baby Blanket! Pictures belong to Michelle Westlung and Anne Schüler unless otherwise noted. Theme images by Jason Morrow. Powered by Blogger.